Why should I live at Aspire at West Campus? Aspire at West Campus is an exciting graduate student community located just minutes from the University of Iowa. What floorplans does Aspire at West Campus offer? Aspire at West Campus features 1 bed - 1 bath, 2 bed - 1 bath, and 2 bed - 2 bath floor plans. Residents can choose to sign for a fully-furnished or unfurnished floorplans. For additional information, please view our floorplans page. What amenities are featured at Aspire at West Campus? Residents living at Aspire at West Campus enjoy some of Iowa City's best amenities, including a clubhouse with study center, study rooms, dog park, on-site fitness center, and a CAMBUS stop. For more information, please visit our amenities page. What are the current prices? For pricing information, please call the Aspire at West Campus office at 319.464.0902 or visit our availability page. Do my roommate and I pay the same rate? Not necessarily. We do individual liability leasing which means that your lease agreement only applies to your individual bed space. How can I guarantee my current spot or apartment? The only way to guarantee your spot at is to sign a lease agreement. While completing an application starts the process, it does not fully secure a space. How do I sign my lease? All leases are signed electronically online via the ResidentPortal. Your guarantor also has an account that they must use to sign their lease documents. You do not have to visit the office in order to sign your lease contract. Who needs to sign the lease? A lease contract is only valid if the primary lease holder (the resident) signs the documents. If there is a guarantor, the guarantor must also sign the lease. Aspire at West Campus will then countersign after all parties sign all documents. When will my new lease start? All new renewal leases start on August 10th, 2019 and end on July 31, 2020. 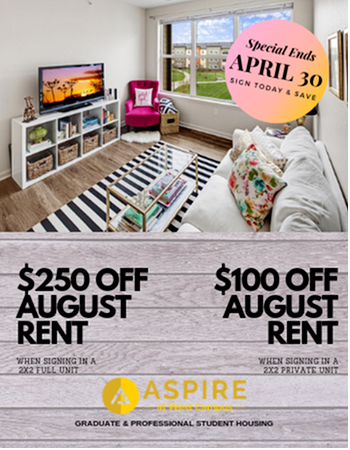 Please contact the leasing office if you want to learn if you qualify to live at Aspire at West Campus. What is a renewal lease? If you are already a resident, you do not have to reapply. Instead, you will complete a renewal lease that will renew your contract for Fall 2019. Am I guaranteed the same apartment when I renew my lease? Unfortunately we cannot guarantee your spot. All leases are signed on a first-come, first-served basis which is why you should renew your lease as soon as possible. Login to the ResidentPortal and find your renewal offer located in the red banner at the top of the page. Click "Review offer" and follow the prompts. Once you click "Complete Renewal", our leasing team will be notified that you have accepted your renewal offer and will generate your updated lease for signature. You will receive an email when your lease is available on the ResidentPortal. All parties (including any guarantors) are required to sign the lease document. Once you have signed your lease, you have officially secured your spot for next year!